One of the nicest complements is when a family invites me back to shoot another wedding. I shot Dee & Simon’s wedding in Bermuda a few years ago and now have photos to share of her sister Theresa’s fall vineyard wedding in Rhode Island. 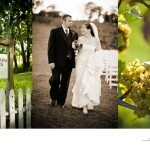 It all took place at Greenvale Vineyards.